Writing a children's book was an unexpected step, inspired by a trip to Egypt. In fact, I should say I owe it all to my mother, who read about a tour to Egypt in a family magazine. I wasn't sure about Egypt because Europe is more to my liking, but Mother was insistent and so I agreed. We took my two nephews along for the ride, and they became the "models" for the two young heroes of the book, Justin and Adam Sinclair. 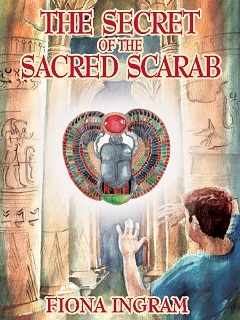 The story of the sacred scarab began life as a little anecdotal tale for my nephews (then 10 and 12). When we got back to South Africa and had admired the photos and sorted out the souvenirs, I wanted to give them something special so they could remember the trip. I picked up a writing pad and a red ballpoint pen (I remember the colour so clearly) and thought ... "What's it called?" Then, without even thinking about it, I wrote the title, The Secret of the Sacred Scarab, and the first word, Egypt! The rest just seemed to flow. I used the actual trip as the guideline and tried to incorporate the many unusual things that had happened to us, just infusing them with more sinister meaning. With a black-hearted villain like Dr. Khalid for an arch-enemy, it wasn't too difficult. This short story grew into a children's book, the first in the adventure series, Chronicles of the Stone. It had to become a series because, by the end of the first book, I realized that the children couldn't possibly save the world in one book ... they'd have to carry on. The story just grew from there. When I finished the manuscript, I sent three chapters and a polite letter off to 35 British literary agents. In my innocence, I already saw myself as the next J.K. Rowling, with agents clamouring to represent me. What a blow! Out of all the rejections, only two generous agents told me what I needed to know: that I could certainly write, the action was good, the plot was exciting, the characters nicely defined, and that I should cut the book in half and persevere. I took their advice and here I am now, with my first book under my belt, and the second and third in the pipeline. The book has done me proud and won more than a few nominations and awards. Although it hasn't been easy, I learned an incredible amount in a very short space of time. Writing articles is not the same as writing books, so the world of book publishing has been an entirely new experience. I have finished the next book in the series - The Search for the Stone of Excalibur - a huge treat for young King Arthur fans. The first chapter is up on the Secret of the Sacred Scarab website, but you have to endure the Journey, enter the Tomb of the King, and translate the Curse of Thoth to be able to read it. Some exciting news: I have begun Book Three - The Temple of the Crystal Timekeeper - and my travels and research will be taking me to Central America soon. Visit the Chronicles of the Stone website to find out more about the Scroll of the Ancients and the mythology behind the series. Hint: click on the red seal.